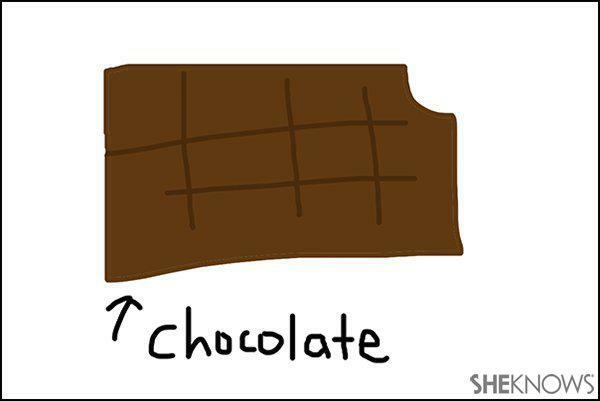 I just want chocolate, because I always want chocolate. It’s that simple. t What do I want for Valentine’s Day from my husband now that I’m a mom? A date night with just the two of us? Poetry? A trail of rose petals leading to a bed with satin sheets? A diamond necklace? A surprise trip to Fiji? An elaborate second wedding to reinstate our vows? t It’s really quite simple. t Chocolate. I just want chocolate, because I always want chocolate, and Valentine’s Day is a really great excuse to consume more of it in one sitting. t Do I want to go out on a date on Valentine’s Day? No, no I don’t. The restaurants are crowded and it would be difficult to find a sitter. All I want to do is stay home and do what we usually do after the kids go to sleep but with more chocolate. t The chocolate should arrive in a heart-shaped box. They taste better. t And they must have a variety of chocolates inside, such as orange cream filled, and caramels and yes, even coconut. I love the coconut ones — why do so many people hate those? I’m glad though, because then I get them all. t That’s it! It really is simple. My husband follows these simple guidelines each year with great success, and I’m sure this year our celebrations will be just as delicious… er, I mean romantic. t Happy Valentine’s Day! If you celebrate, enjoy your chocolate!